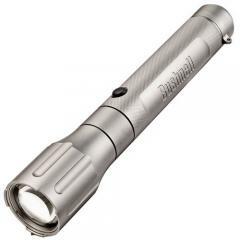 The Bushnell 165 Lumen HD is a powerful flashlight designed for long-lasting illumination and extreme durability. Its durable aircraft-grade aluminum tube is hard-anodized for enhanced wear resistance and provides a high level of protection against impacts and water intrusion. Powered by a pair of lithium batteries, the light delivers a bright, long-range beam that provides uniform illumination out to the edges. Its Luxeon diodes are up to 20 times brighter than ordinary LEDs, and deliver a square beam pattern that is ideal for searches. The rotating head provides convenient mode selection, including continuous, safety strobe and SOS patterns. The tailcap on-off switch features a glowing battery life indicator that remains on at all times, making it easy to find your flashlight in the dark.